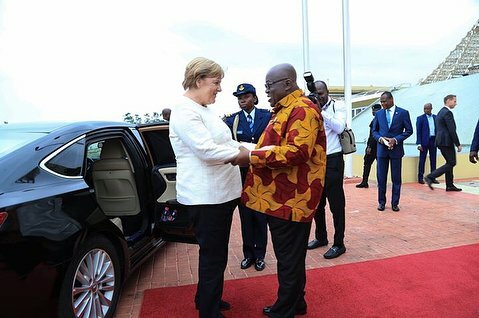 German Chancellor Angela Merkel was in Ghana for a one-day state visit. Furthermore, her visit to Ghana was part of her three days working visit to some West African countries. She is in Ghana to strengthen bilateral, economic and industrial trade. Moreover, the President of the Republic of Ghana Nana Addo Dankwa Akufo-Addo hosted her at the Jubilee House. Also, there was a State lunch in her honour. A lot of discussions happened between Ghana’s President and the German’s Chancellor. All the conversations were all geared towards strengthening the ties between these countries. Furthermore, after the discussion, Ghana signed an agreement with Germany and this partnership agreement involves that the world biggest Automobile Company, Volkswagen which is based in Germany to set up one of their assembling plants in Ghana to boost industrialization and create both permanent, direct and indirect jobs for the teeming youth in Ghana. Moreover, the Chancellor made it known to Ghana that although we are trying our best to curb corruption in the country, Ghana still has to do more. She also said that Germany is prepared to partner with us to realize our Ghana Beyond Aid mantra.